World Mosquito Day is an annual observance held on August 20. It was created by British medical doctor Sir Donald Ross to commemorate his discovery that female Anopheles mosquitoes are responsible for malaria transmission. Malaria is an infectious decease caused by parasitic protozoans. It is widespread in tropical and subtropical regions in Africa, Asia and Latin America. Until 1897, people had not known how malaria was transmitted, so they could do nothing to combat the disease. In 1895, Donald Ross, who was working in the Indian Medical Service at the time, first observed the malaria parasite (Plasmodium) in the gastrointestinal tract of a mosquito. However, the historic discovery was made two years later. 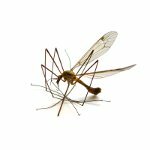 On August 20, 1897, Ross confirmed that the presence of the parasite inside the mosquito was not a coincidence. He was awarded the 1902 Nobel Prize in Physiology or Medicine for his discovery of the life cycle of Plasmodium. World Mosquito Day celebrations have been held by the London School of Hygiene & Tropical Medicine since the 1930s. They aim to raise awareness about malaria treatment and prevention. Other health care organizations and institutions, such as Malaria No More, also organize events and activities on the occasion.